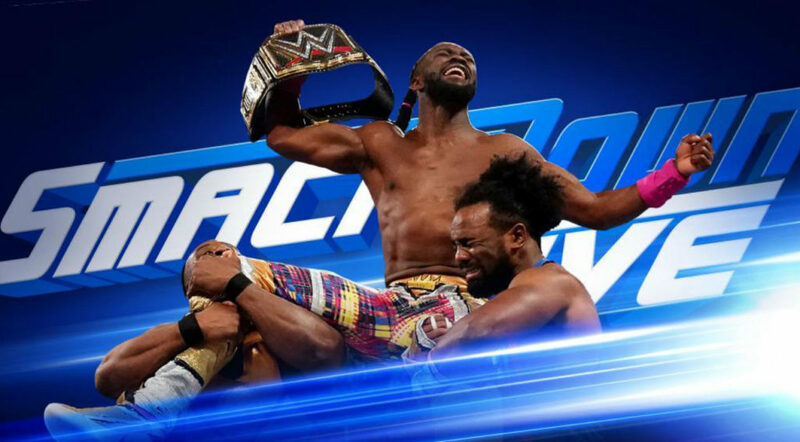 The eventful first episode SmackDown LIVE after WrestleMania 35 featured the triumphant return of new WWE Champion Kofi Kingston, a brotherly tag team battle, and more. The show opened with The New Day officially ushering in Kingston’s new title reign. Under an arch of rainbow balloons, Big E both praised his friend’s win and showed off his own impressive ability to do full splits. Xavier Woods and E both talked about Kingston’s career and said that The New Day “came together in an effort to reshape culture and change history,” an effort that culminated on Sunday. Kingston began to make his own, humbler celebration speech, but it was interrupted, like last night’s winner-take-all RAW main event, by The Bar. Sheamus and Cesaro claimed that they actually saved Kingston from losing his title the previous night because he couldn’t have beaten Seth Rollins without his friends by his side. They then proposed a six-man tag match in which they would be accompanied by their new friend from RAW, Drew McIntyre. The New Day vs. Sheamus, Cesaro, and McIntyre was the episode’s main event. The Europeans—after a brief interruption by Sami Zayn—put up a good fight, but they were no match for the multi-time tag team champions. Kingston pinned Sheamus after Trouble in Paradise and was joined in the ring by his supportive family. Though the landscape of WWE changed dramatically on Sunday and could do so again next week with the Superstar Shake-Up, this week, all remained well for the blue brand. This episode of SmackDown LIVE also featured another trios match with possible implications for next week’s Superstar Shake-Up, when Aleister Black, Ali, and Ricochet defeated Rusev, Shinsuke Nakamura, and Andrade (with Lana and Zelina Vega). At first, Ricochet was trapped in his opponents’ corner, then Rusev. After Black nearly put Andrade away with a springboard moonsault, “El Idolo’s” teammates broke this pin and everything went crazy. Ricochet took flight, everyone fought each other, and Ali ultimately put Andrade way with a 450. But Ali barely had time to get to his feet after hitting his aerial maneuver before he was RKO’d, truly “from outta nowhere,” by Randy Orton. Rusev attempted to attack Ali as well, but was taken out by Kevin Owens with a Stunner. Orton, Owens, and Ali weren’t the only Superstars out to make statements on this show. As Carmella and R-Truth celebrated the former’s win of the WrestleMania Women’s Battle Royal, Samoa Joe entered the arena to surprise attack the former U.S. Champion. After choking Truth out with the Coquina Clutch, Joe got on the mic and bragged about destroying Rey Mysterio in under a minute at WrestleMania. As he prepared to make a confident exit, Joe was interrupted by Andre the Giant Battle Royal winner Braun Strowman. These two big boys were ready to throw down immediately. Their aggressive confrontation ended in a stalemate that fans have to hope is the sign of a true one-on-one match in the future. The new Women’s Tag Team Champions, The IIconics, had much more success in their first post-WrestleMania defense—by their own design. Billie Kay and Peyton Royce revealed they had set up a match against a local tag team—the Brooklyn Belles—who nobody had ever seen in WWE before. The IIconics made short work of this duo, but Paige teased a bigger challenge for them soon. Backstage, the former leader of Absolution and SmackDown GM said that she would bring an “impressive tag team” of her own to challenge Kay and Royce next week. This episode also reminded us of double champ Becky Lynch’s first challenger: Lacey Evans, a much more legitimate threat than the Brooklyn Belles. Lynch made an in-ring speech about the targets on her back and pledged to pull double duty on both RAW and SmackDown no matter what happens with the Shake-Up. She said she’d sleep with one eye open her whole career if she had to in order to retain her titles but was quickly blindsided by Evans again as she posed with them. It’s only a matter of time before “The Lady” and “The Man” face off officially in the ring.